Here we are providing you updated and most relevant Study notes on Tort of Defamation for Law Entrance Exam. These study notes are highly recommendable for all those who aspire to crack CLAT, DULLB, AILET and other Law Entrance Exam. If a person injures the reputation of another person he commits a civil wrong i.e. defamation. Libel – It is a representation made in some permanent form e.g. writing, printing, picture, effigy or status. Note: - Libel is actionable per se, slander is note actionable per se. in case of stand proof of special damage is required to claim damages. Defamation is civil and also defined in criminal law as criminal wrong under section 499 of IPC. In criminal law only libel has been recognized as an offence. The plaintiff – Respondent, Manjulata about 17 years of age, and was living with family in Jodhpur. A news was plublished in Dainik Navjyoti that Manjulata had run away with a boy named Kamlesh after she went out of her house on the pretext of attending night classes. The news item was untrue and was published negligently. Her marriage prospects were badly affected. Held – Court held that defamatory was an actionable per se and general damage of Rs. 10,000/- were awarded. 1. The statement must be defamatory. 2. The statement must refer to the plaintiff. 3. The statement must be published. A statement may be prima facie innocent. If any statement on the face of it seems to be innocent but its secondary meaning or a disclosure of some truth it seems to be defamatory. Example: A got married to B this statement if published it seems to be innocent statement but if A is already married and this truth came in news than the situation will suggest that the above statement is defamatory. It is not a tort but a criminal offence, if it would harm the reputation of that person. Publication of statement is must as communication only with the plaintiff is not suffice defamation is injury to the reputation and reputation consists in the estimation in which others hold him and not a man’s own opinion of himself. In the eyes of law, husband and wife are one person and the communication of a defamatory matter from the husband to the wife or vice versa is not publication. TJ Ponnen wrote letter to his wife Rathi containing some defamatory imputations about his father in law. Mr. M.C. Verghese Mr. Verghese brought on action against T.J. Ponnen. Supreme Court held that letters addressed to the wife can’t be used as evidence as it is a private communication between husband and wife. 1. Justification of truth – Law does not allow a man to recover damages in respect of an injury to a character which he either does not or ought not to possess. If the statement is true then it is a defence. 2. Fair Comment – No comment is unfair if it is based on true facts. If facts are substantially correct though untrue on some minor details, the comments based on those facts will be fair. In case circumstances freedom of speech is protected even if it is exercised is defamatory. It overrides the individual right to reputation. A speech made during parliamentary proceedings or in state legislature and publication of the same, has the constitutional protection as the constitution grouts privilege to any such speech. No action for defamation lies against any person involved in judicial proceedings. Military, naval and state communication is also privileged. A statement is said to have a qualified privilege in spite of it being false and defamatory if there is no proof of maliciously. 2. The statement must have reference to such occasion. 3. It must not be made maliciously but with proper motive. A. The statement must be defamatory. B. The statement must refer to the plaintiff. 5. A news article was plublished in Dainik Navjyoti that Manjulata had run away with a boy named Kamlesh after she went out of her house on the pretext of attending night classes. The news item was untrue and was published negligently. Does this amount to defamation? 6. In the eyes of law, husband and wife are one person and the communication of a defamatory matter from the husband to the wife or vice versa is not publication. 8. A speech made during parliamentary proceedings or in state legislature and publication of the same, has the constitutional protection as the constitution grouts privilege to any such speech. 9. Action for defamation lies against any person involved in judicial proceedings. 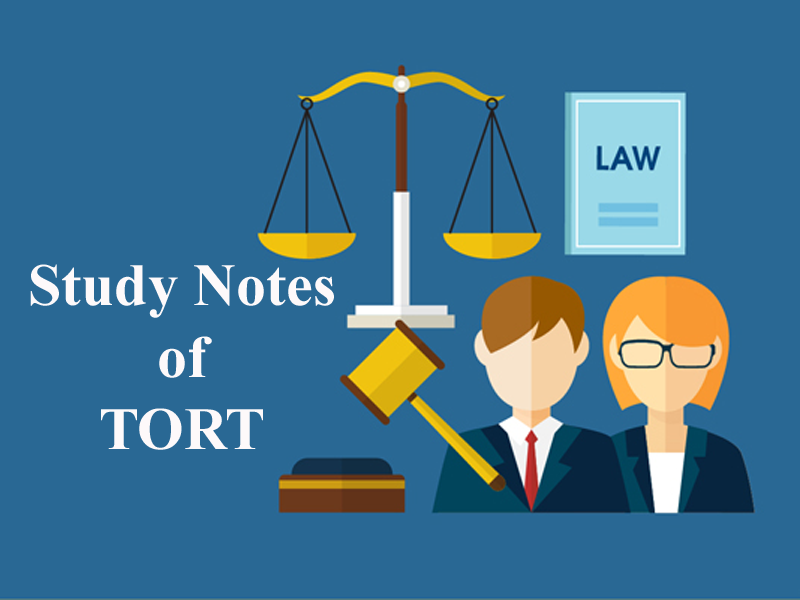 Get the updated and most relevant study notes on Torts in Defamation for upcoming CLAT and other Law Entrance Examination.